This car tablet headrest mount can provides a secure and stable environment for your backseat passengers to play games and watch movies while Driving. Easy to install without tools. Adjust your car headrest pole to the best position, easily attach the bracket to the headrest pole and tighten with the 2 adjustment knobs on both sides. Every family kinds of tablets. Our car tablet mount are generally compatible with most 6" to 10.5" devices. 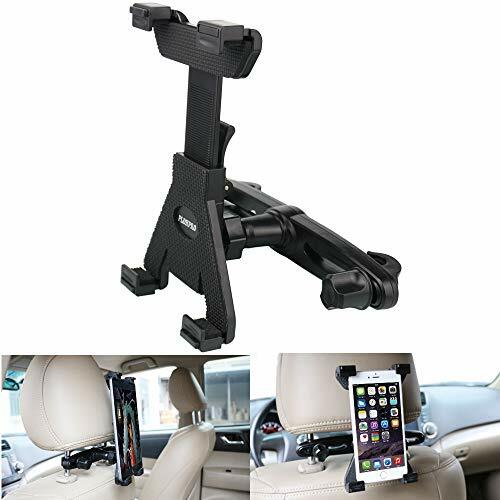 Just grab your device on the tablet mount and enjoy it, and when leave the car and just take of it easily . Tilt and rotate - Get a perfect and comfortable viewing angle. With 360° degree rotation ball, you can get any angle you want, so you can keep your tablet in the portrait and landscape sight ,then enjoy the perfect view. Material characteristics: The headrest base made of durable steel POM plastic material, wear-resistant ABS back clip, plus a layer of sponge to protect the tablet, to ensure the safety of your tablet. More: Motorola G5 Plus/ G4/ E4/ Z2 Play/ Droid Turbo 2; ASUS ZenFone 2/ 3, ZenPad 3S 10/9.7/ S8/ 8 Z380/ 10.1 Z300/ Z8s; Google Pixel/ Pixel XL, Nexus 4/5/ 7/10, BLU R1 HD/ Advance 5.0/ Studio X8; Sony Xperia Z5/ XZ/ XA1; LG G5; Alcatel; Dragon Touch X10 10.6 and etc. 30-day money back guarantee and 1 year replacement warranty, as long as you encounter any quality problems from our products, we will immediately assume responsibility and meet with your satisfaction. 【Easy Design】The tablet car mount allows your children or other Back seat passengers to engjoy the long distances journey and drive safely, avoiding to use the expensive backseat entertainment systems. And it is widely compatible with various Backseats of car and is easy to install. Hold the iPad firmly on the headrest to protect your beloved hand pad from any vibration or vibration. 【Quick Installation】 This tablet car headrest mount Without any tools,Just rotate the rotary knob to attach or detach the mount to tablet car mount posts quickly (the distance between the metal posts (2.5" and 6" wide). When you mount the nintendo switch car mount , Until you hear the sound of "zizi" then make sure the installation is successful. The tablet is installed with one hand and released quickly. 【Car tablet holder compatibility】 The maximum thickness of the clip is 0.7 inches, the universal ipad car mount can be used for 6-10.5 inches tablet , the tablet Samsung Galaxy Tab 4 3 / iPad Mini / iPad Air 2 / iPad Air / iPad 4 / iPad 3 / iPad 2 iPad Pro, PAD or other tablet PC are all okay ,can be fixed firmly . 【Easy Adjustable】 360 degree multi-angle rotation adjustment for the best viewing angle. Enjoy the perfect companion for watching movies, reading e-books, playing games, chatting and entertainment. 【Safety Security】 The durable ABS clamp and POM base bracket ensure that your tablet is securely attached to the headrest pole. Whenever you encounter any quality problems, we take responsibility and resolve your issue immediately. If you have any questions about this product by PLDHPRO, contact us by completing and submitting the form below. If you are looking for a specif part number, please include it with your message.